The modern Doctor Who series has done much to rehabilitate the once-damaged reputation of the Daleks. These days, few make jokes about the their inability to climb stairs. And if they do, the Daleks float up and exterminate their asses. However, as much as nu-Who has tried to sell us on the idea that the Daleks’ traditional plunger arms are terrifying murder devices, the fact remains that after millions of fictional years in which to refine their design, the Daleks have never built themselves a proper hand. Hulking brutes from a rocky, unnamed planet, the Ogrons were (barely) smart enough to serve as hired muscle. They could operate complex equipment and even spacecraft, but the mind boggles at the number of diagrams and Post-It Notes that must have been involved in their training. 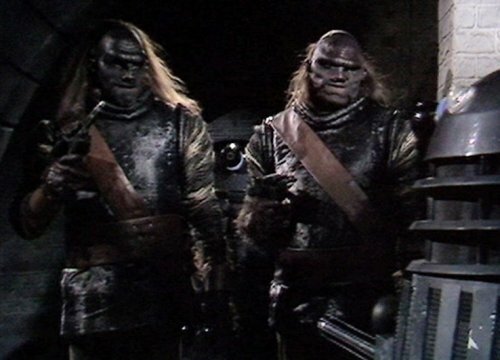 The following year, the Ogrons made a second appearance as minions of the Master, who in turn was working for the Daleks. It was all part of a complicated plot to pit 26th Century Earth against the Draconian Empire, leaving both sides too weak to fend off a Dalek invasion. Surely the Ogrons themselves didn’t understand it, but were happy to play along nonetheless.